On the mornings of March 12th and 13th, CMT proudly hosted the Sangamon CEO class at their Springfield, IL, headquarters. Sangamon CEO is a one-year course in business and entrepreneurship for high school seniors throughout Sangamon County, IL. This year, the class has 42 students representing 14 schools. 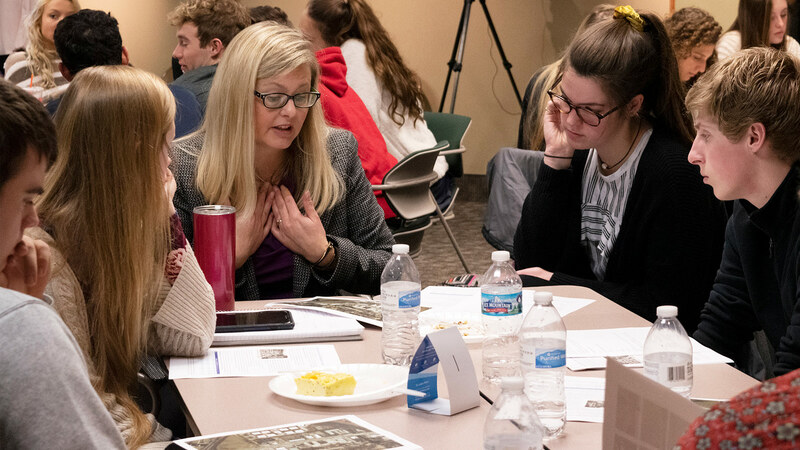 As a part of the course structure, the students visit numerous area businesses throughout the school year to hear from over 100 speakers representing a wide variety of industries, all while learning business principles. 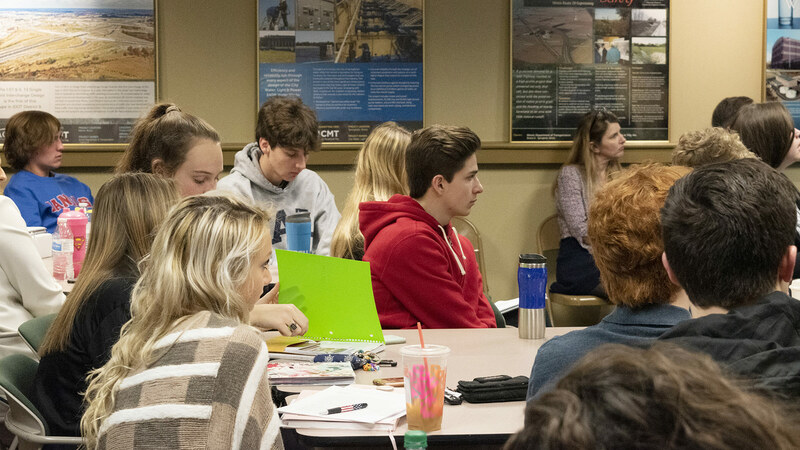 The knowledge that they gain throughout the year ultimately helps students launch their own startups and compete in a Shark Tank event in April. Although the students are introduced to numerous professions throughout the year—including contracting, politics, food service, accounting, banking, manufacturing, and entrepreneurship, to name a few—their visit to CMT was their first introduction to engineering and professional services. As a result, CMT staff took the opportunity to make an impact. 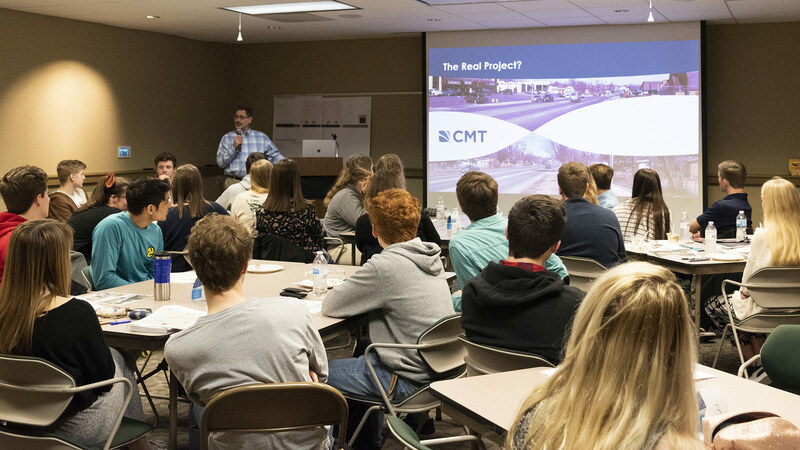 On the first day, CMT volunteers told the story of the company’s history and feature projects, explained why infrastructure is important to our daily lives, and detailed the numerous career paths within the engineering profession. 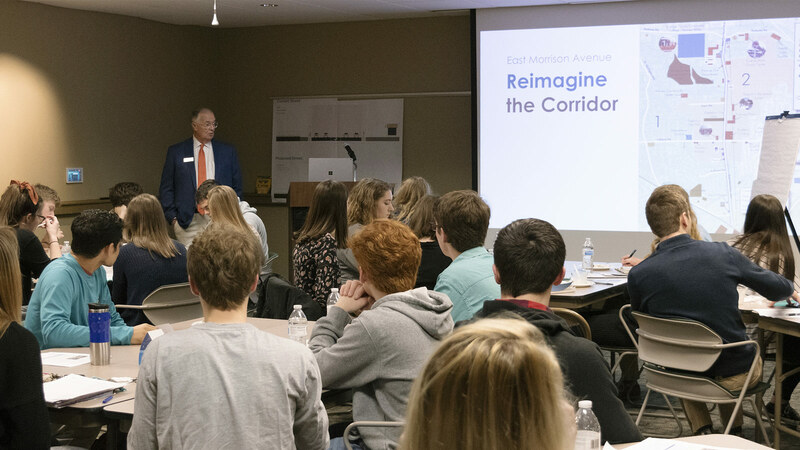 Once the students conceptually understood what engineering is, CMT volunteers challenged them to apply this knowledge by solving an engineering problem: revitalize a blighted urban corridor. 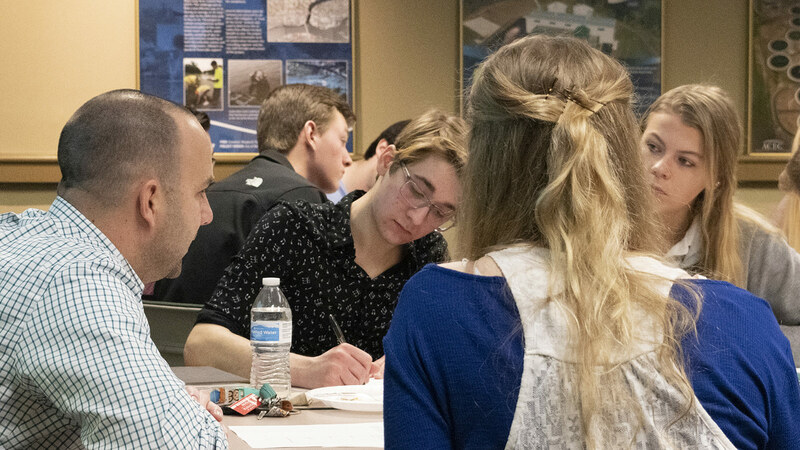 To quickly tackle this large case study, the students broke out into six teams, two each addressing one challenge of either pedestrian mobility, corridor aesthetics, or public engagement. CMT volunteers coordinated with the students to generate ideas, introduce concepts, and lastly send them home with worksheets and a case narrative for their particular challenge. On the second day, students returned having reviewed the case and completed their worksheets. CMT volunteers met with the groups to narrow down students’ proposed concepts and ultimately assemble a proposal. Then, one member of each group presented their proposal to the class. The mobility groups offered proposed sections for the roadway; the aesthetics groups suggested greener designs, lighting and incentives to attract businesses; and the public engagement groups highlighted how they would “find champions” and get the word out about this project. After the student presentations, CMT volunteers revealed that the fictional case study is actually a real project that CMT is currently working on. The students then got to compare their ideas with what CMT is actually proposing and implementing, much of which overlapped. Even further, the students had some additional, innovative ideas that the project manager took note of for consideration. Lastly, CMT closed the day by facilitating time for questions. CMT’s HR manager lead the discussion and answered or directed questions to other CMT volunteers. Students asked questions on numerous topics ranging from resume tips, getting internships, how projects are funded, and what other professions support engineering, such as marketing and accounting. Before leaving CMT to return to their schools, the students thanked CMT for an engaging and hands-on experience. By all measures, Sangamon CEO’s visit was a successful event for both CMT and the program. CMT is proud to be a champion for the engineering profession, both in introducing it to students and representing the industry throughout the communities we serve. Thank you to all of the CMT staff who helped to lead and coordinate the event, including Christy Crites, Kristin Timmons, Jeffery Large, Roger Austin, Chris Stritzel, Joe Miller, Alex Block, Emily Munday, Cassie Reiter, Angie Koester, and Alaina Beaird.